Here is a course that will help you feel more comfortable and confident riding your bike. 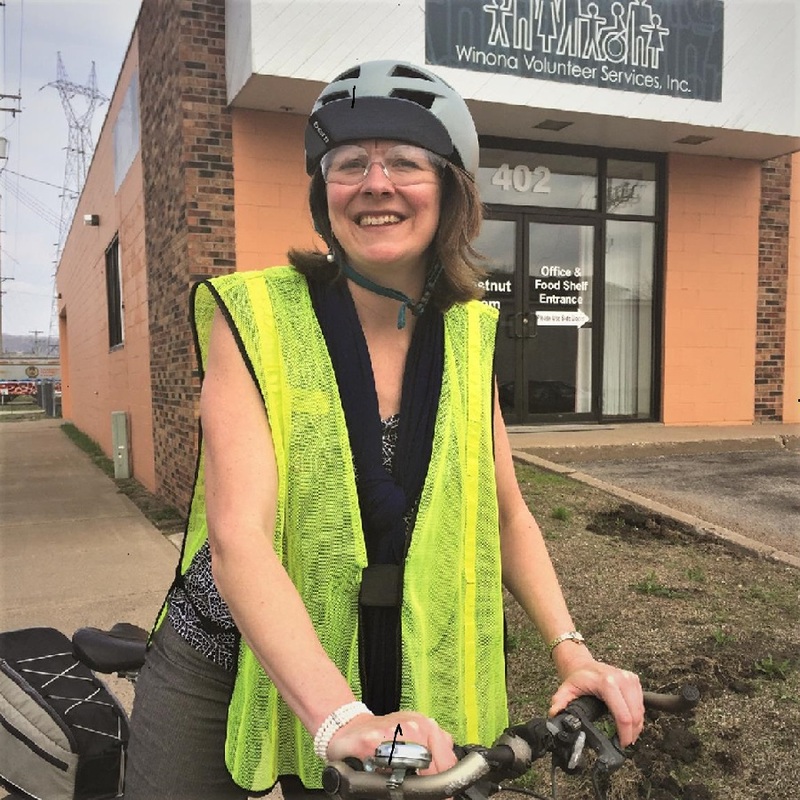 Cycling Savvy is returning to the Twin Cities area again this summer with a three-part bicycle safety class. By enrolling in this class you will feel secure going anywhere on your bike safely and confidently. 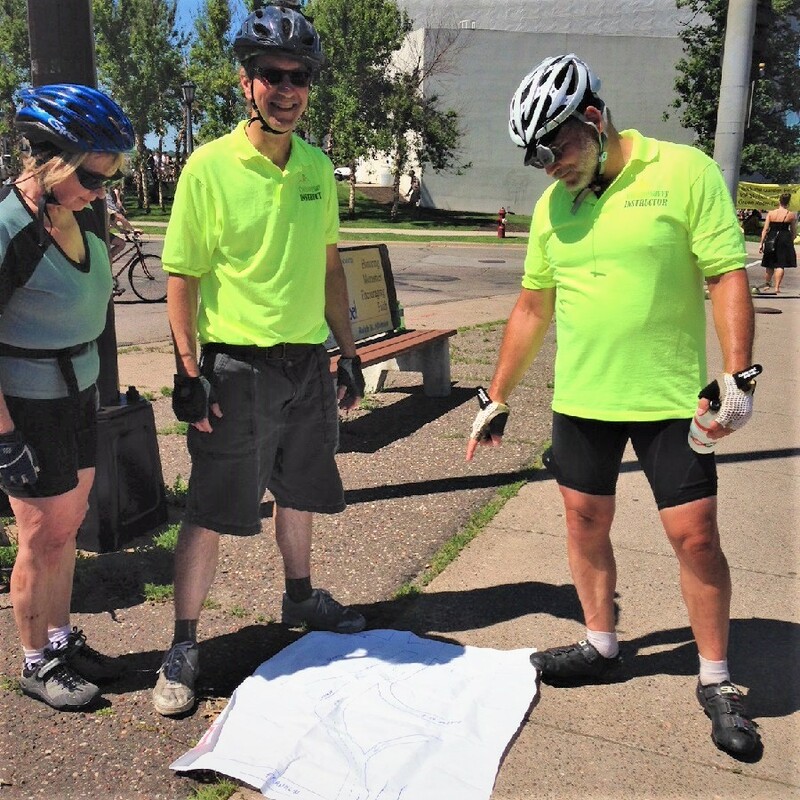 Bike with Hokan and John Hardy doing a “chalk talk.” Sign up for Cycling Savvy to learn more. While Cycling Savvy inevitably teaches some of the same essential traffic cycling principles and skills as other cycling courses, it is an entirely new curriculum. From the ground up, it is built upon an understanding of the needs of adult learners. The course addresses the challenges of today’s changing behavior that is strongly rooted in our traffic culture. Much of the content in the Cycling Savvy curriculum is completely original. Traditional content is framed and delivered in unique ways to maximize the learning process. It is a modular course, consisting of three, 3-hour classes, with seasoned certified instructors to help you along the way. Through guided discussion with video and animation, this three-hour session will familiarizes students with bicycle-specific laws, traffic dynamics and problem-solving strategies. Students discover that bicycle drivers are equal road users, with the right and ability to control their space. This session is an experiential tour of Minneapolis roads. This 3.5 hour final course includes some of the most intimidating road features (intersections, interchanges, merges, etc.) a cyclist might find in his/her travels. The students travel as a group, stopping to survey and discuss each exercise location. After observing the feature, discussing the traffic dynamics and the best strategy for safe and easy passage, the students ride through individually and regroup at a nearby location. Please note, the Tour of Minneapolis session* above is only available for those who take the full course. The first two sessions may be taken á la carte, in any order. Options for Class III are: Saturday, June 9th; Saturday July 21 or Saturday September 22. Class hours are from 1 p.m. to 4:30 p.m. Location for this final class will also be at 110 Union Street S.E., room 107 Minneapolis, MN 55455. 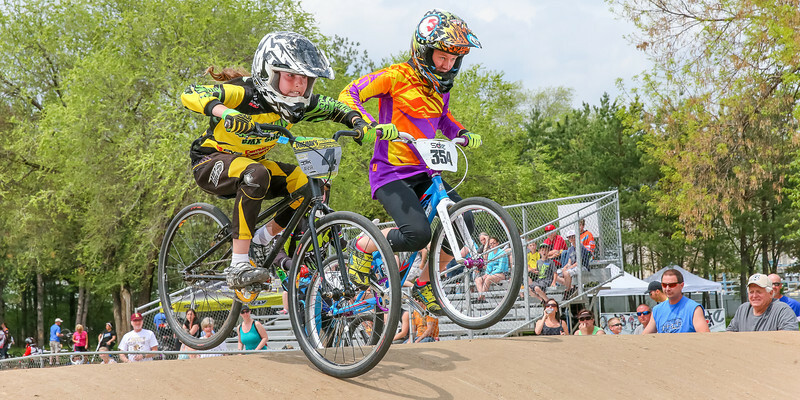 This entry was posted in News and tagged Bicycle education, Canbike, certified bike instructors, Cycle Savvy, cycle training UK, drive your bike, International Police Mountain Bike Association, Law Enforcement Bicycle Association, League of American Bicyclist on May 21, 2018 by Russ Lowthian. The sun is warming the morning air as you ride along the Mississippi River Trail (MRT) through Saint Cloud, MN. Now in Granite Country, you are looking for a change in scenery as you pass a group of buildings, then realize its St. Cloud State University (SCSU). Across the Mississippi River and easy to reach crossing the bridge with your bike is the popular Munsinger/Clemens Gardens. This area, as the river bends to the southeast, is prime and ready to give you and your friends or family many biking opportunities when visiting here. The Lake Wobegon Trail is a family friendly paved path system offering everyone a fun time. Saint Cloud is labeled a city, but don’t let that scare you away. The area’s spacious layout provides plenty of room to escape from all the noise of everyday life that can bombard many with stress. The area offers many parks, family friendly trails and other attractions to give you memories that will last a lifetime. Now with the Lake Wobegon Trail running through Saint Cloud and stretching 63 miles to Sauk Center, you can visit three colleges along the way. Besides SCSU, the Granite County Area is also home to Rasmussen College, the College of Saint Benedict and Saint John’s University. 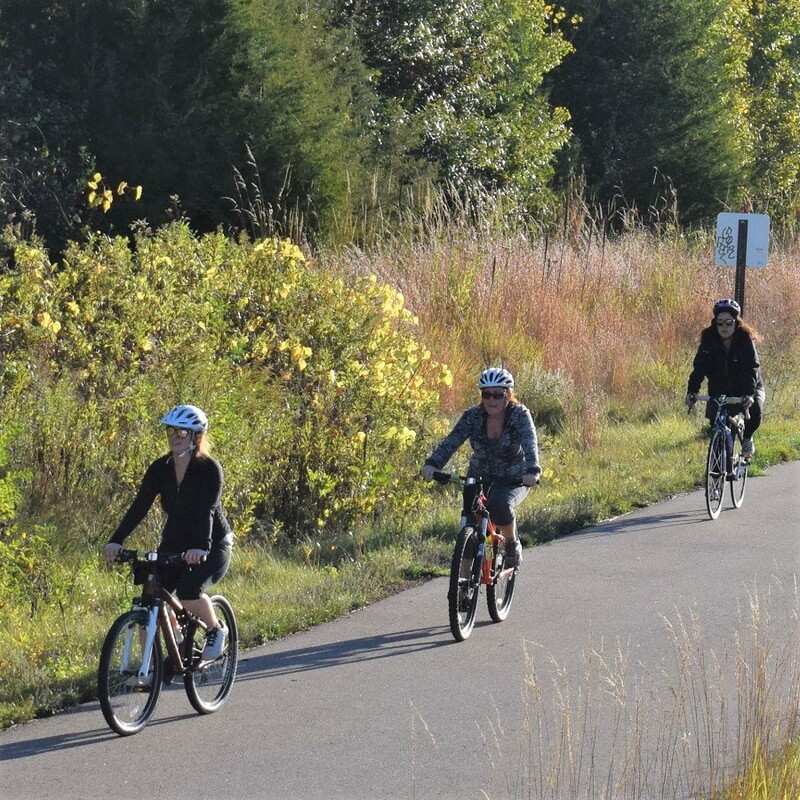 Their presence in the area and the communities they create, along the trail system, helps add to the area’s welcoming atmosphere and unique points of interest for cyclists visiting throughout the year. 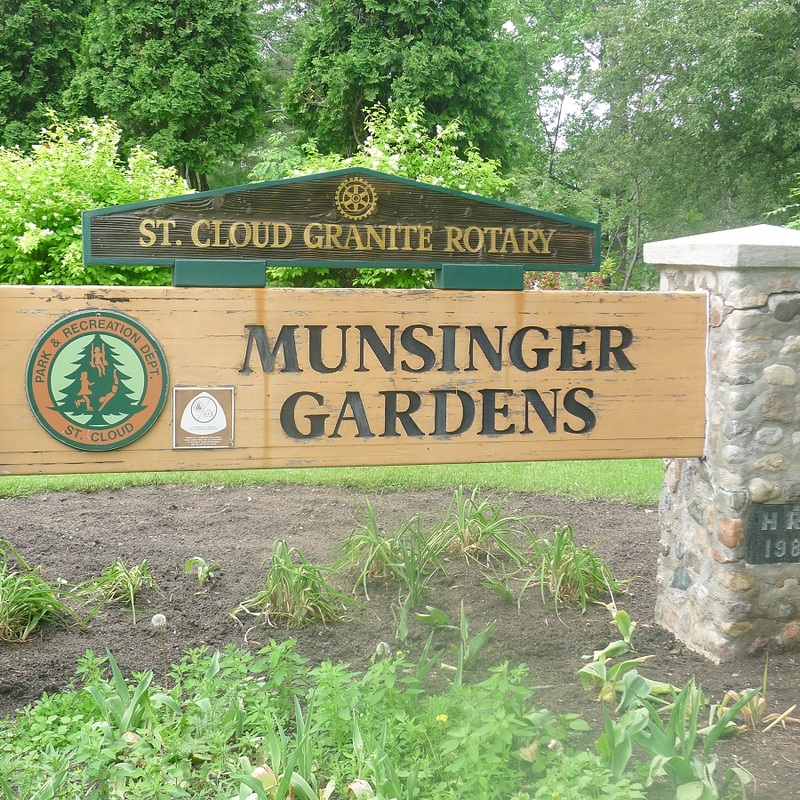 The Munsinger Gardens is unique botanical experience along the MRT where you can stroll the paths experiencing its treasure. The Saint Cloud Area is also a bike-friendly community, awarded by the League of American Cyclists. This gives you the assurance there are plenty of places for you to comfortably roam around using designated bike lanes and trails. And while there are plenty of fun things to do on west side of the river. Don’t forget to cross the river and explore the jaw-dropping and joy-spreading Munsinger and Clemens Garden’s. Granite Country has many opportunities for you to put your tires to the pavement, or whichever surface you prefer to ride on. 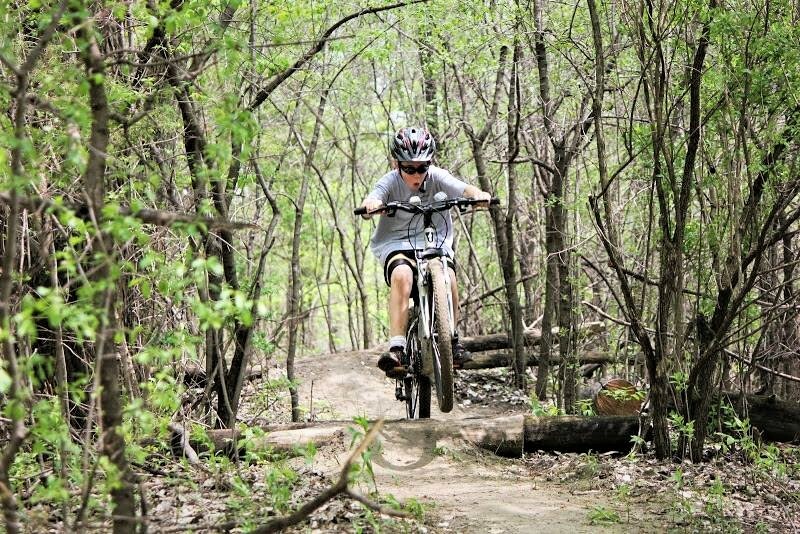 There are many trails tucked into the area’s various parks, several chances to put your mountain biking skills to the test, trails that take you beyond the city limits, and more. No matter what kind of adventure you’re looking for, Granite Country has you covered. For more information see At-A-Glance St. Cloud and our HaveFunBiking map of the area. 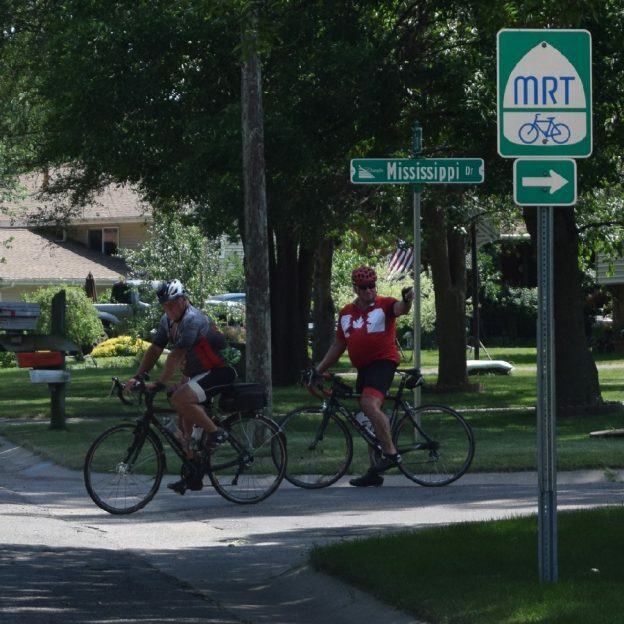 Riding the Mississippi River Trail through the neighborhoods as the route rolls into Saint Cloud. If you go west out of St. Cloud you can take the Lake Wobegan Trail and stop along at one of the many trailheads along the way. You can also travel along the famous Mississippi River Trail as you explore St. Cloud and everything you meet along the river’s edge. There even points to cross the river and see what the other side has to offer. 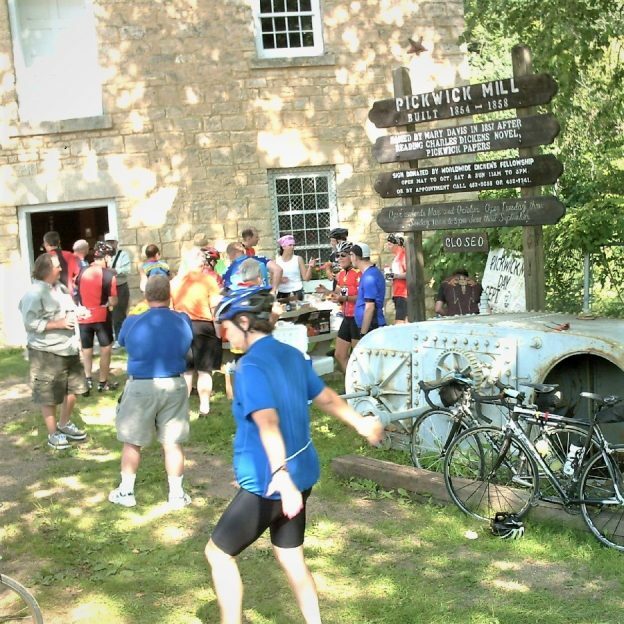 For more bicycle touring loop options see Central Minnesota Bicycle Club’s many mapped bike routes. The largest park in the Stearns County Parks System is bound to have a plethora of biking opportunities. The trails will give you a great overview of the reserve has to offer and they all connect in some way so it’s easy to switch when you want to. There is also some section for mountain bikers to pedal over granite bedrock that is a billion years old. Saint Cloud also has its own BMX park. You can hit the tracks, watch races on the weekends, and work on your skills if you are there during the week. Riding out on the Jail Trail is one of several mountain biking options in Granite Country. In addition to the Quarry Park and Reserve, the area has a few more mountain biking opportunities for you. 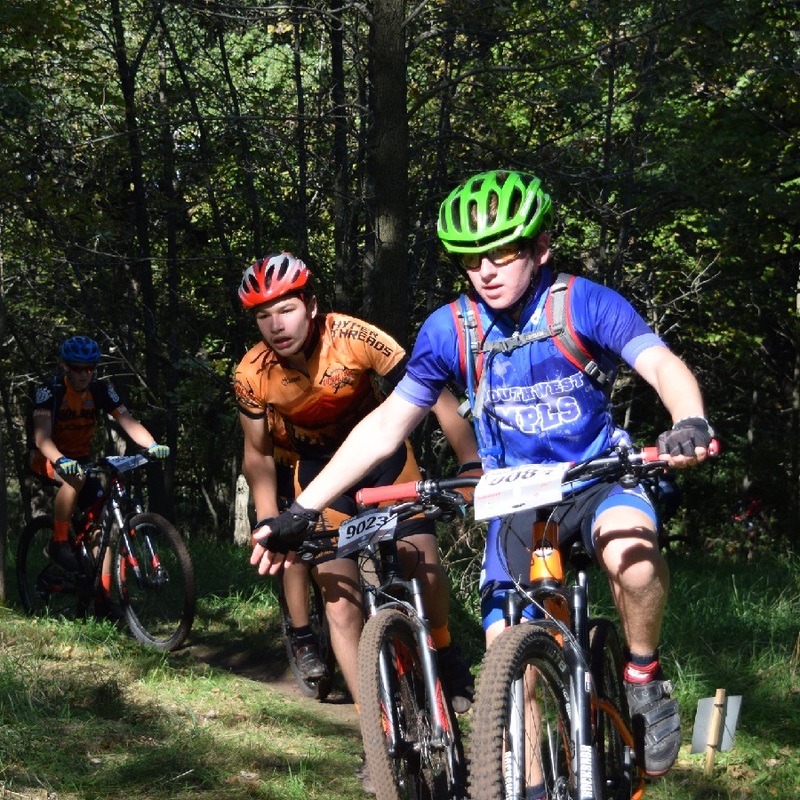 The Jail Trail is an intermediate level mountain bike loop system located east of Saint Cloud. The main loop has some easy elevation challenges, but overall stays pretty flat. There are also additional side loops that add some technical difficulty. Then there’s the heavily wooded Plum Creek Trail, which is an exhilarating five mile-plus ride on a very narrow single-track filled with its share of hills. If you don’t want to battle mountain bike trails, but still want to go an adventure you’re in luck. You can hop on the Oxcart Trail that starts at Southside Park and travels north through Lions Park, Municipal Park, and Island View Park. Then there’s the Mayhew Creek Park Trail, Sauk Rapids’ newest trail, which consists of two loops and gives you just over one mile of riding. Also, the secluded crush aggregate Rotary Trail takes you through a wooded wetland complex that goes north of Bob Cross Park to the Bob Cross Nature Preserve. There are boardwalks and observation decks along the way. There are plenty of other ways to navigate your way around Granite Country on you bike. Some of the routes lead to downtown St. Cloud where you can explore its many shops and restaurants. See more at Visit Granite Country. 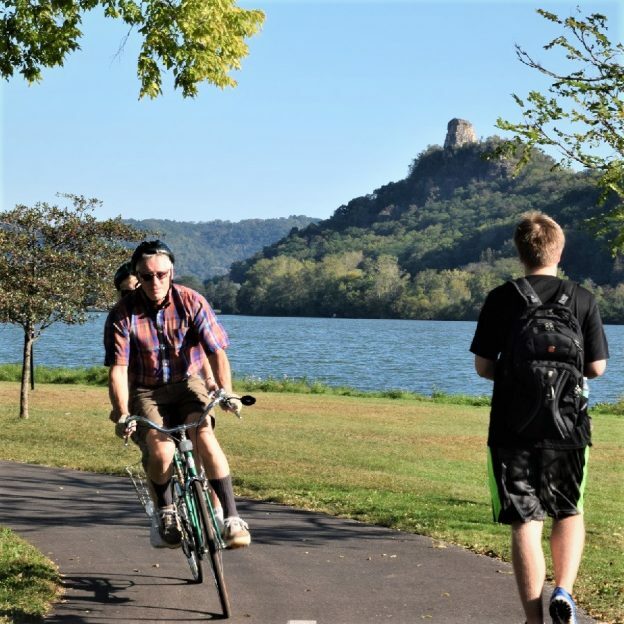 This entry was posted in Destinations, News and tagged Bike friendly community, Clement Gardens, Granite Country, Jail Trail, Lake Wobegon trail, League of American Bicyclist, Mississippi River Trail, Munsinger Gardens, Pineview Park BMX, Plum Creek Trail, St Cloud, St John's, St. Ben's, St. Cloud State, Sterns County Park System on October 29, 2017 by Andrew Ellis. 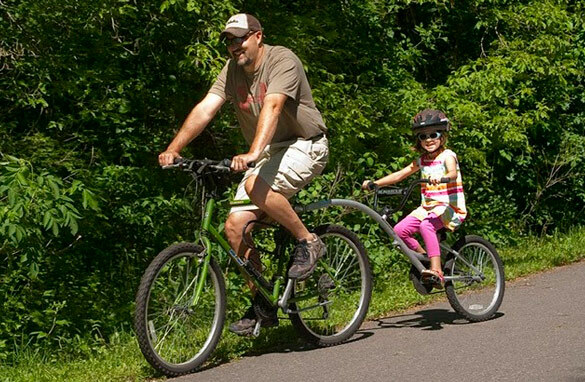 Congratulations New Ulm, One of the Latest Bronze Bike Friendly Communities in the U.S.
New Ulm achieved honorable mention bike status designation in 2016. 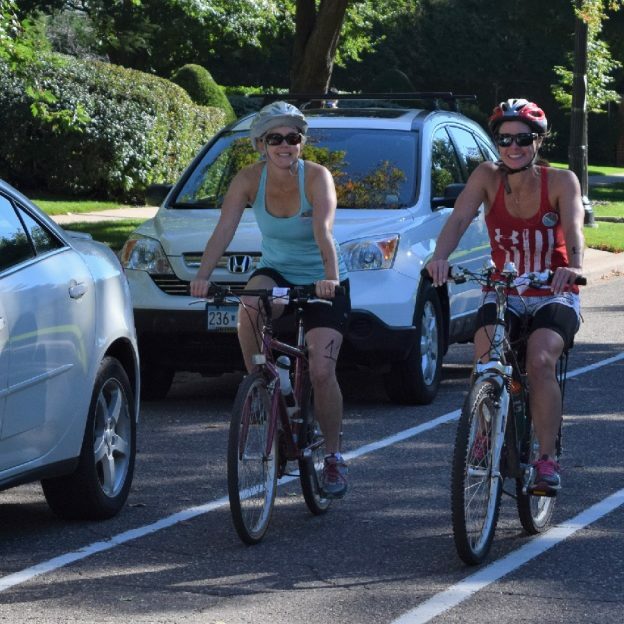 Last week it was announced they are the 21st Minnesota community to earn the bike friendly honor, with bronze. 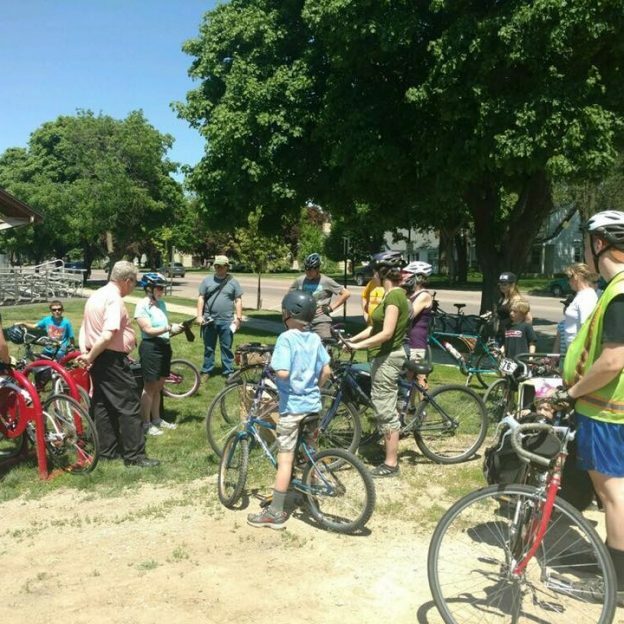 Provided by the League of American Bicyclists (LAB), to celebrate the honors local residence and dignitaries convened in Harman Park, this last Saturday for a bike ride marking the occasion. 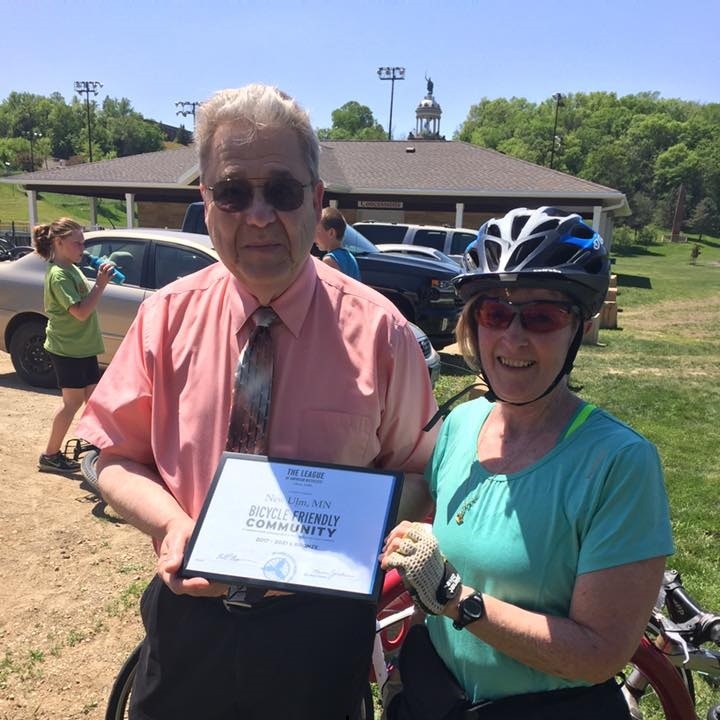 Cindy Winters from Hearts Beat Back Project is shown here presenting the LAB Bicycle Friendly Community plaque to New Ulm Mayor Bob Beussman. 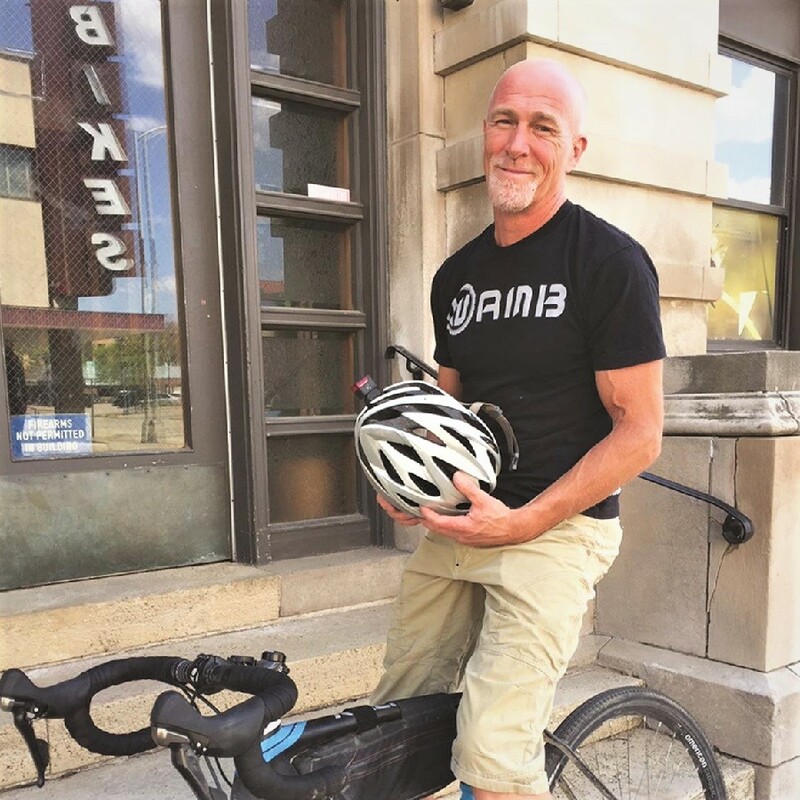 “This is a huge accomplishment that everyone in the entire community should be very proud of,” said Cindy Winters, manager for Hearts Beat Back: The Heart of New Ulm Project, which collaborated with The New Ulm Bike Club and the City of New Ulm to submit the application. 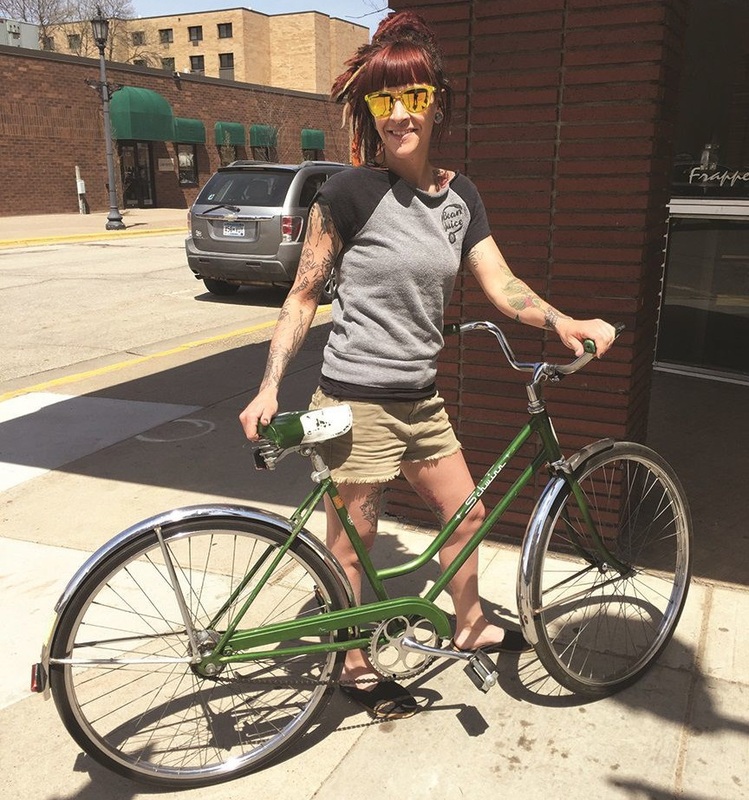 “Over the last several years, individuals and organizations throughout our community have worked very hard to help implement changes that make it safer and more enjoyable for everyone to bike,” Winters said. 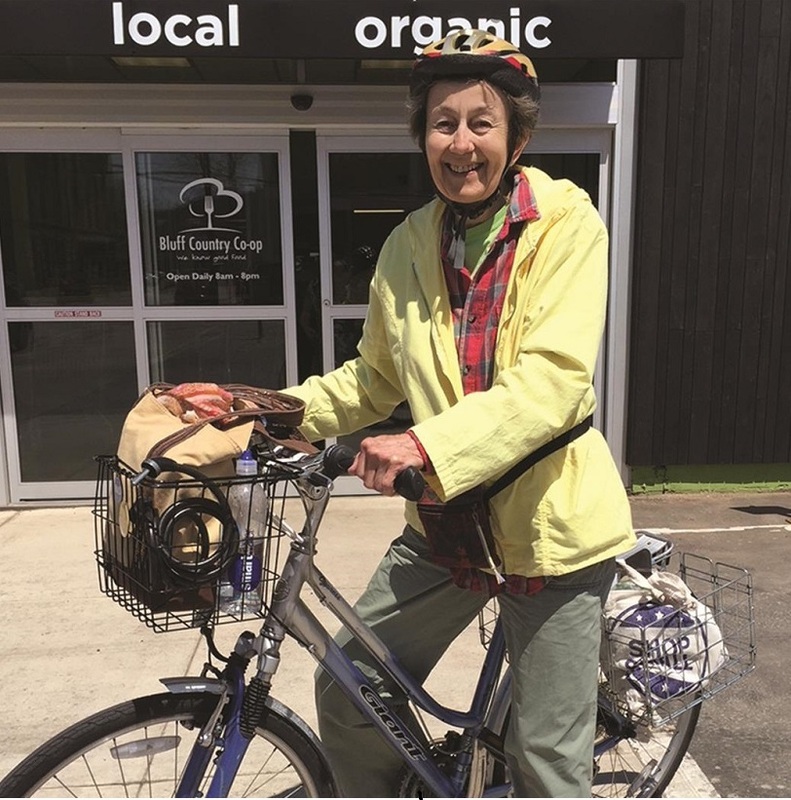 A Bicycle Friendly Community welcomes bicyclists by providing safe accommodations for bicycling and encouraging people to bike for transportation and recreation. Making bicycling safe and convenient are keys to improving public health, reducing traffic congestion, improving air quality and improving quality of life. More information on the Bicycle Friendly Community program is available on the League of American Bicyclists website at: http://bikeleague.org/community. To find out more about the city and county bike maps of New Ulm, click here. 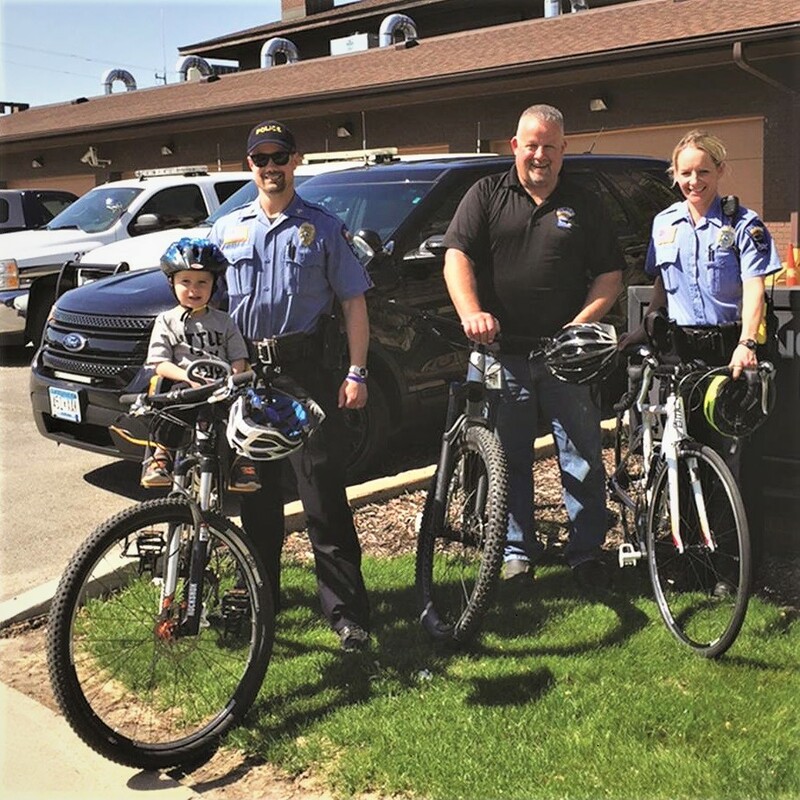 This entry was posted in News and tagged Bicycle Alliance of Minnesota, Bike friendly community, Bike friendly New Ulm, BikeMN, Hearts Beat Back, League of American Bicyclist, New Ulm Bike Club, New Ulm MN, Safe Routes to School, The Heart of New Ulm on May 15, 2017 by Russ Lowthian.